These one-day events are tours of various historical sites and settings around the state, many off the beaten path, providing participants with the unique opportunity to see sites not normally open to the public or otherwise inaccessible. Our UNBARRED events are a crucial link for connecting people to Wyoming’s historic places. Unbarred tours have also included workshops and expert speakers. These events would not be possible without the support of sponsors, including museum partners, nonprofit organizations, historic architects, and preservation experts giving talks about buildings and cultural landscapes. Unbarred tours allow citizens to see up-close some of Wyoming’s best examples of historic preservation and with all of us coming away with a feeling of connection to Wyoming and our western tradition. Unbarred tours also provide a learning opportunity for the public, from knowledge of the National Register of Historic Places to how-to-workshops on restoring historic windows and repairing building foundations. UNBARRED: Kaycee, Wyoming: The Alliance for Historic Wyoming partnered with Kaycee's Hoofprints of the Past museum to put on a tour of the Ullery Ranch in Kaycee followed by an afternoon open house at the museum. The tour of the ranch featured several historic homestead buildings that have been lovingly restored by AHW board member and owner of the ranch Trish Ullery-Whitaker. Mary Humstone, AHW board member and formerly of the National Trust for Historic Preservation, gave a presentation on the significance of historic barns across Wyoming. Spear-O-Wigwam Workshop and UNBARRED: In collaboration with Sheridan College and University of Wyoming's Saturday U program, the Alliance for Historic Wyoming hosted a historic log maintenance workshop with National Park Service expert Harrison Goodall at Sheridan College's Spear-O Mountain Campus. The campus was formerly known as the Spear-O-Wigwam dude ranch. Buffalo Soldiers UNBARRED at F.E. Warren Air Force Base was a tour that celebrated the history of the Buffalo Soldiers in Wyoming and focused specifically on African American soldiers stationed at F.E. Warren Air Force Base in Cheyenne, formerly known as Fort D.A. Russell. Brick Workshop and Tour: Those who attended the historic brick maintenance workshop were treated with instruction by historic masonry repair expert Peter Farquhar. Peter showed the group how to repoint historic brick using a 1930s Tudor Revival home in Laramie as an example. Following the workshop, the Alliance for Historic Wyoming gave a tour of the University Historic District, also known as the Tree Area, that highlighted Tudor Revival architecture in Laramie. Unbarred at the AMK Ranch opened up the beautiful AMK Ranch located on the eastern shores of Jackson Lake. The former vacation home now serves as a research station for the University of Wyoming inside Grand Teton National Park. Attendees were able to see the ranch that is typically not open to the public and learned about its history by preservationist and AHW board member Mary Humstone. Piney Creek UNBARRED, a combination workshop, speakers and tours of historic sites and buildings in the area. Many thanks to the Ucross Foundation. 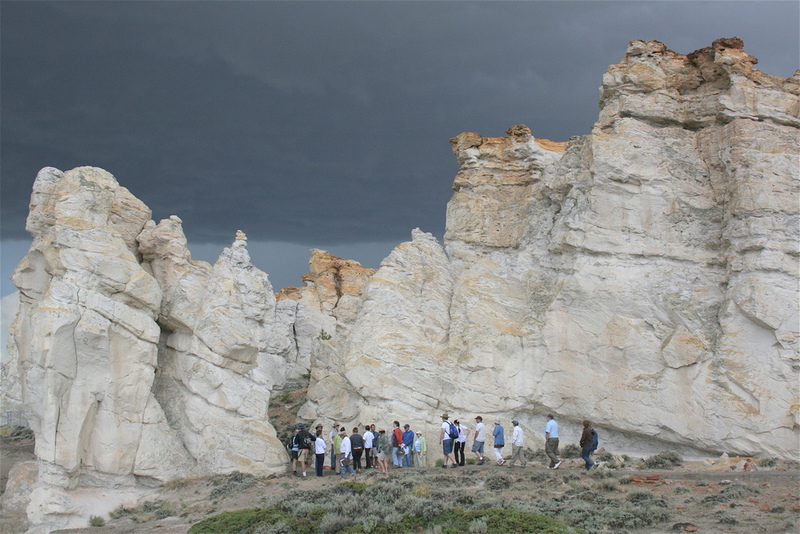 UNBARRED Sweetwater County focused on the history of human impact on the landscape and the modern issues and procedures associated with public land use. 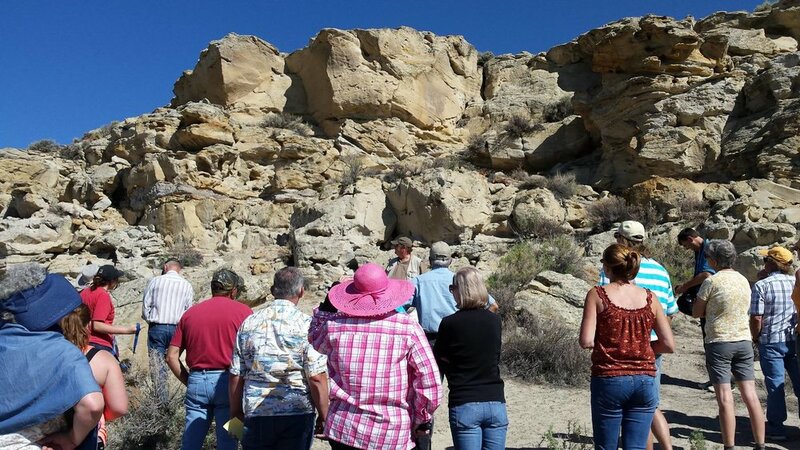 The tour included the Point of Rocks stage station, the Tolar rock art site, emigrant trail inscriptions, the ruins of the coal mining town of Hallville, and the Crookston Ranch. Many thanks to the Sweetwter County Museum and the Bureau of Land Management.